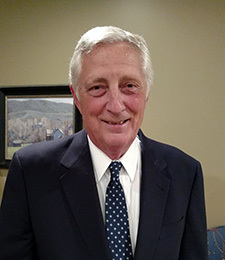 Professional Experience: Bob Wilde was admitted to the practice of law in Utah in 1979. Before entering law school he was a pilot in the Air Force for four and one-half years and prior to that taught junior high school math. He has represented clients in a general civil litigation practice focusing on employment matters from 1979 to 2017, with Cook and Wilde (1984-89), Robert H. Wilde, P.C. (1989-2012), and Blackburn and Stoll (2012-2017). He has handled employment cases representing employees and employers in a broad scope of statutory areas of employment law: Title VII, FMLA, ADA, USERRA, FLSA, ADEA, STAA, AIR-21, as well as state employment contract, non-competition, tort and statutory claims. Civic and Professional Involvement: Bob served on the Advisory Committee to the Utah Supreme Court on the Rules of Evidence for 26 years. He was a bar examiner writing and grading bar exam questions on legal ethics for 12 years and then a member of the Utah State Bar Admissions Committee for 14 years. He was a member of the Cottonwood Heights Board of Adjustment for seven years and served as chair for three years. He is currently a member of the Cottonwood Heights Planning Commission. He has been active in Scouting and was recognized with the Silver Beaver award for his contributions there. Experience: Member of the Federal District Court for the District of Utah panel of mediators and previously the Utah Anti-Discrimination and Labor Division panel of mediators. Has mediated dozens of employment based and other claims.